This past July, a church committee requested a new message on the electronic sign, which faces the Oak Ridge Turnpike. The message they requested was “Black Lives Matter.” The board of the Oak Ridge Unitarian Universalist Church, or ORUUC, voted to approve it, and the message was added to the sign’s series of scrolling messages. I’m sure you’ve read some authors that really stick in your craw. Artists of the written word that cause you to think, cause you to get pissed, cause you, most of all, to feel that sense of uncomfortable that comes from a raw, exposed nerve. There are several of these talented people that float through my reader. Some I am avid fans of, others I take out in the dark of the moon and peruse with witchy thoughts abiding because they require, by default a place where the blood of their story can mingle with mine. Joys of Joel is one of those artists for me. Joel lives in the Philippines. I’ve never met the person, but when I read the words, like those of Shawn L. Bird, E.I. Wong (really funny in a twisted way HAHA! ), and UP! :::urban po’E.Tree(s), I am moved to places I’ve visited but, perhaps, took for granted. In the latest poem (at this writing) by Joys of Joel, they write: Don’t wait for me; Ours is not a love story. (Find it HERE), I am compelled to remember lost loves of my own. I am to take that path rarely traveled. I mean, what’s done is done, right? Or what’s over is completed. But. It reminded me of a poem I wrote a while back which also reflected on a powerful moment in my life when I realized I’d just made a massive mistake. I knew I’d never again see that person though I treasured every moment I spent with them. It was my fault. I’m re-sharing this “These Are My People” poem because of that line. You can find it here: The End. I’m not a religious person. I don’t classify or call myself anything in particular except maybe leaning towards spiritual. It’s not because I don’t believe in “something” but because I see validity is so much. A few years ago, I felt a strong push as I heard a loud voice tell me to go to the ORUUC. Over the course of two years I found the family I’d been promised by the winds. They didn’t come in the shapes, sizes, or ages I expected, but there is not a doubt in my heart or soul they are my blood kin. From the youngest children, such as Rayn, to the oldest of children such as Miss Marge, I was blessed with knowing, learning, and understanding some of the most beautiful people I could have asked for. Outside of the confines of the church there were some people whom could meet my level of tomfoolery, but never in my adult life have I found the encouragement to be everything I was meant to be as I did there. But how can I say that an entire church is my family? A church? It hardly seems possible. What I learned from them, will follow me everywhere I go because I value the life-lessons I was given. When I first started going to the Unitarian Universalist Church, I was wisely advised to take my time in selecting what I wanted to do because everything has passionate players. They weren’t kidding. I watched the different volunteer positions to see which I felt I could be enthusiastically involved with. I discovered I loved to greet people, loved to protect, and loved to serve. I ended up joining the safety team, co-leading the hosts and greeters, as well as serving as fifth Sunday usher. I even did coffee a couple times. Find what you’re passionate about and without excuse or what-if’s, jump in and do it. One of my favorite things to do on a Sunday morning was to be greeter. I have a knack for remembering the names with faces I see often. I could greet nearly everyone in our medium sized congregation by name as they approached the door. That I could do that, hug them, welcome them, demonstrated I truly was glad to see them. Learning people’s name that you see every day no matter who they are is key to discovering some of the coolest people you might never had opportunity of doing so if not for that small effort. When you remember people’s names, they know that someone in the world knows they exist. I believe that’s crucial to mental health. Many times I’d listen to people in the neighborhood where I lived talking about how unhappy they were with where they lived (I was one of them for a while), their circumstances, their addictions, their kids, the etc. What I noticed was that none of them were doing anything to change any of that. They just noted it sucked but continued the same behaviors. I learned that it’s okay to complain because, really, that’s just an acknowledgment that an issue exists. I saw solutions pouring out of the people at ORUUC far more than I saw problems. It was the most collaborative group of people I’ve ever worked with. Even when hackles got ruffled, which happens in any large group, everyone worked to make sure that the final solution was a balance. Do what you need to do to bring the positive changes into the world because happiness is worth it. Pastor Jake Morrill’s closing words for the services he gives are ones I took to heart. He says, “Be pilgrims for justice and fools for love!” What profoundly simple words with such an enormous responsibility behind them. If he chose a different closing, I’d walk away rather bummed because I truly took on the challenge when he would use it. I believe we should all fall madly in love with the world every day. No excuses, just open your eyes and fall. Even the people or things that irk your sensibilities the most are worthy of love. It’s not for you to choose who is okay or what is okay to love, just do it. I’m not in any way implying that you can’t have preferences, nor that you should eliminate safety measures for the sake of love. I’m saying that when you look at the world as if it were your intimate lover and you its muse, you’ll find a different kind of kismet with the divinity that is everything; The atom of begin times, the eve of creation. To clarify, I call everything the Universe, because as a rule, we can all agree there is one. If I called the Universe God, then that specific version that you know/doubt/reject/hate/don’t believe in, would negate this idea. BUT! If I call it the Universe, we can meet at whatever version of that ultimate we accept. Using this idea, be the fool for love because love has a transformational magic that can be witnessed where two hearts meet in unison. Thus, if you’re falling madly in love with the world every breath you take, does it not then make sense that love will rule your world? And further that love will light your path to happiness because love doesn’t hurt? Indeed. As I was taught by those who love me there, be that fool for love. A short while before I moved away, I received an email that reminded the Sunday volunteers of the roles they promised to step in to fill. A reply to that email was astounded at the amount of people that took responsibility to make the service appear to be without effort. It made me giggle a bit because I was actively involved in the volunteer activities. I knew how many people it took because of that. It’s the same when facing life’s many challenges (like moving out of state with a weeks notice). You’re not Atlas. Just like sharing your great experiences with your friends, sharing burdens makes them easier to bear as well. Nothing limits you to only putting on your good face. Being a human with All The Bumpy Bits is by far more deeply satisfying overall in my experience. When you find people willing to be human with you, that’s a rare and beautiful gift. Shine for them even from your darkest places. It’s worth it. There are so many lessons I’ve learned from the beautiful people I am honored enough to call my friends at ORUUC that I couldn’t possibly cover it in one writing. I hope you will bear with me as I process this tremendous life shift. Together we can be incredible humans together on this wild journey called life. All The Bumpy Bits and Arts and Articles Edition (Same as Arts and Essays) are found HERE with more to come soon! My Patreon Account found HERE! 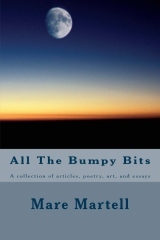 A complete (through 2014) compilation of articles, poems, essays, and art by Mare Martell. Racism, Feminism, Love, Love thy neighbor, honor, truth, lies, and other miscellanea cascade a life learning curve of one woman author. A self professed lover of life and happiness, this book drives through some dark corners with the high beams of activism running full bore through sexual assault, domestic violence, love, loss, and personal growth. I was scrolling my Facebook feed and I found a picture of Coral and Ray looking into each others eyes while they danced together. When I first met them, it was in the social hall at the old church building. They didn’t attend the service but had scooted in to “hang out.” They were so warm and kind that I instantly realized they were kindred spirits with one another. They were just content as clams to be nearby. I loved them warmly then as I do now. This is a poem inspired by that picture I found but can’t yet retrieve. I checked the forecast but it said nothing of despair. It said nothing of the wrenching guts or the tearing of the hair. Told by Walter Scott’s murderer that watched that human die. The rules are far less flexible, in fact, they’re rather fixed. When will you foolish humans learn, LOVE ALWAYS WINS, not hate.